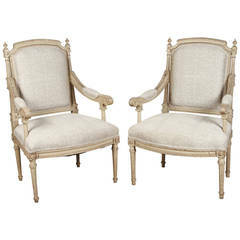 This Pair of Armchairs, France, 2019 is no longer available. 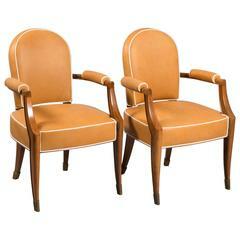 Black metal frames with polished brass details holding a formed foam seat, back and armrests. 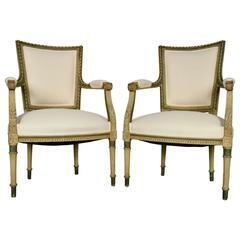 Splayed legs ending in round brass sabots complete the look. 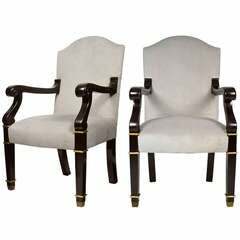 Over-upholstered armchairs with flared armrests, cushion seats and raised on feet of cast and gilded aluminum. Measures; Height 32", width 30.5”, depth 33" Seat Height 15.5”. 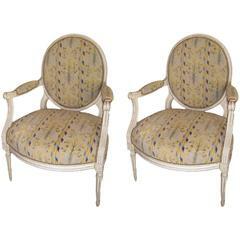 A pair of French 1940s mahogany armchairs in original fabric.